Property Location Located in Omaha, Courtyard by Marriott Omaha Downtown is minutes from Gene Leahy Mall and Holland Performing Arts Center. 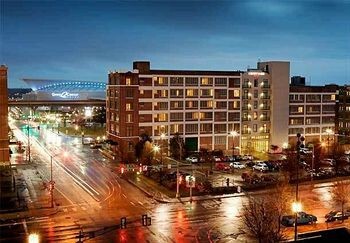 This hotel is within close proximity of Heartland of America Park and CenturyLink Center Omaha Convention Center.Rooms Make yourself at home in one of the 181 air-conditioned rooms featuring flat-screen televisions. Complimentary wireless Internet access keeps you connected, and cable programming is available for your entertainment. Conveniences include phones, as well as complimentary weekday newspapers and coffee/tea makers.Rec, Spa, Premium Amenities Be sure to enjoy recreational amenities including an indoor pool and a fitness center.Dining You can enjoy a meal at a restaurant serving the guests of Courtyard by Marriott Omaha Downtown, or stop in at a grocery/convenience store. Quench your thirst with your favorite drink at a bar/lounge. Buffet breakfasts are available for a fee.Business, Other Amenities Featured amenities include express check-in, express check-out, and complimentary newspapers in the lobby. Event facilities at this hotel consist of conference space and meeting rooms. A roundtrip airport shuttle is provided at no charge.